CHONGQING - It's 11 am and 40 degrees Celsius on deck. Liu Bo and his cleaning team have been working for four hours straight, collecting trash from the river. "Working on the river is harsh. It's either too hot in summer or too cold in winter," Liu said. Liu is a member of the cleaning team in Wanzhou, a district in southwest China's Chongqing Municipality. 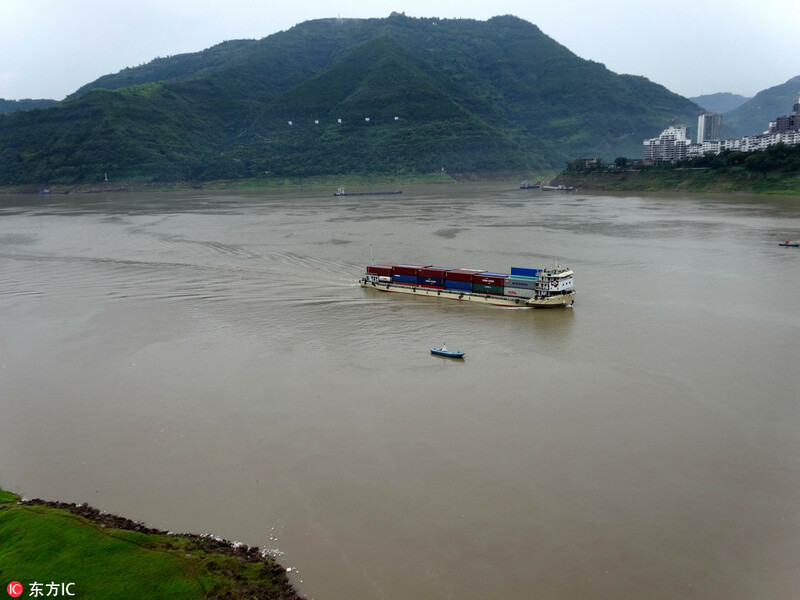 Since the Three Gorges Dam was built, the flow of the Yangtze River has slowed down. As a result, trash and withered plants accumulate rapidly on the water. This is not just unpleasant to look at, but also hinders ship navigation. "If the trash is not cleared in time, it will rot. You could smell the odor even on the other side of the river," said Chen Yu, deputy director with the district's environment and sanitation office. So in 2003, the local government started a river-cleaning project and assembled a cleaning team to collect trash and clean the river. "We live on the boats, sailing with the wind and fighting the waves as we collect the trash," Liu said. "Usually, we start work at six o'clock in the morning and work for a dozen hours straight." The cleaning team now has 25 full-time members, and 20 boats. And recently, technology has become a great help. The team is equipped with four new mechanized boats, and the cleaners can now collect more than 50 tonnes of trash in an hour. "Manual labor doesn't come close. If the team only has nets and pitchforks, 5 tonnes of trash is a whole day's work," said Chen. Last year, the team collected 28,000 tonnes of trash from the river. The local government knows that just cleaning up isn't enough. To solve the problem at its root, chemical plants and battery factories along the river have been shut down, and illegally-operated private dining ships have been blocked from entering the river. Tourists and locals are encouraged not to throw their waste into the river. "My parents used to complain about my job, saying that it was toilsome and lacked high pay," Liu said. "But when I took them to the river bank, they stopped complaining as they saw the river was clean and peaceful. We made the river beautiful again and I'm proud to be on the team."